Napoléon Bonaparte was a French military and political leader who rose to prominence during the French Revolution and its associated wars. As Napoleon I, he was Emperor of the French from 1804 until 1814, and again in 1815. 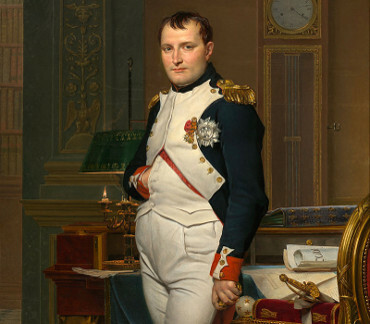 Napoleon dominated European affairs for over a decade while leading France against a series of coalitions in the Revolutionary Wars and the Napoleonic Wars. He won most of these wars and the vast majority of his battles, rapidly gaining control of continental Europe before his ultimate defeat in 1815. Kaiser der Franzosen (1769-1821). A single hair, cut off on his deathbed. [St. Helena. In zeitgenössisch beschriebenem Umschlag. Beiliegend ein weiterer, gleichfalls zeitgenöss. beschr. Umschlag. "Hair | of Napoleon Bonaparte I. 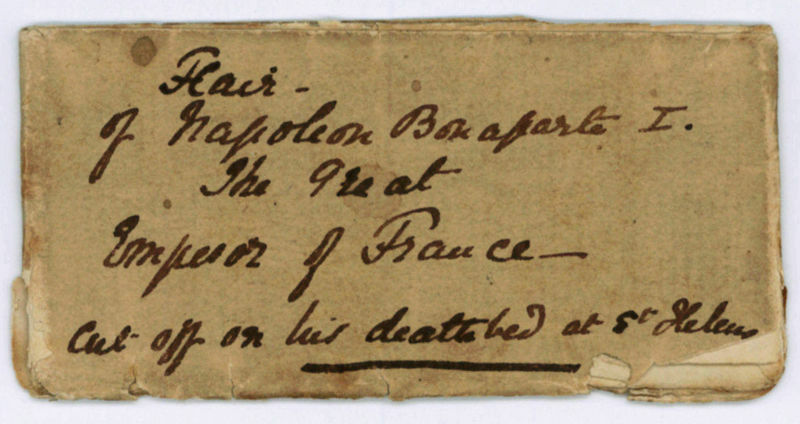 | The Great | Emperor of France | Cut off on his deathbed" - "Napoleon's Hair given Lord Queensberry by Dr Arnot [sic] who attended him on his death Bed at St. Helena". Emperor of the French (1769-1821). 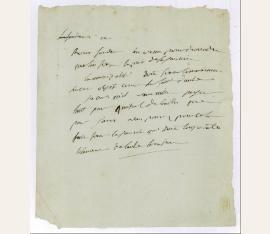 Autograph letter (fragment). N. p. 4to. ¾ p.
Final page of the broullion of a letter to an unidentified recipient, possibly to M. Perrier, director of the arsenal of Marseille, or Sucy, commissaire des guerres. 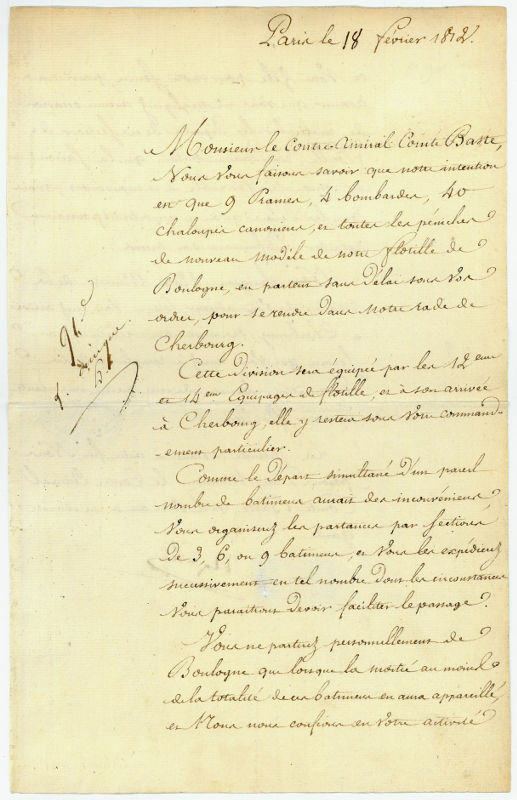 The letter, which contained extensive instructions on the deployment of artillery, was obviously written at the end of 1793 or in early 1794, immediately after the Fall of Toulon, when the Republicans won an early victory over a Royalist rebellion and Napoleon was "inspecteur des côtes". The fragment preserved here begins with the words "Le fondeur est", which are struck out, then continues: "Roux, fondeur, ést venu me demander que l'on fixe le prix de sa journée. La municipalité doit fixer le maximum sur cet objet, comme sur tant d'autres. Je crois qu'il vaut mieux payer tant par quintal de balles que par jours. Vous pouvez, pour cela, faire fixer la journée qui doit toujours être l'élément de toutes les mesures". - Lower left corner torn off (not touching text); some brownstaining, otherwise a perfect sheet. Once in the collection of André de Coppet (1892-1953), now stored at the Firestone Library, Princeton..
Emperor of the French (1769-1821). 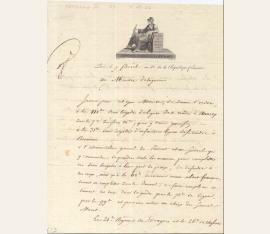 Letter signed ("Napoleon"). Paris. Folio. 2 pp. 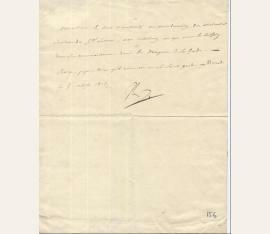 A letter to Rear Admiral Count Batte instructing him how to move a part of the flotilla from Boulogne to Cherbourg. 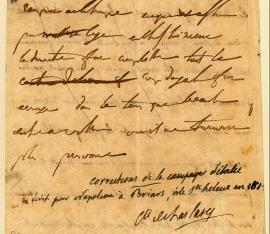 - Napoléon informs Count Batte about his intention to move 9 prams, 4 bombers and 40 canon shallops of the new type without delay from Boulogne to Cherbourg. The division will be equipped with the 12th and 14th garrison of the flotilla and on its arrival at Cherbourg it will remain without any special commander. As the simultaneous departure of such a number of ships would cause inconveniences, Napoléons asks Count Batte to organize the departure in sections of 3, 6 or 9 ships and to send off such a number one after the other as the circumstances will allow him to. Napoléon is convinced that he has to facilitate the passage. He asks Count Batte not to leave Boulogne until at least half of the totality of the ships will have appeared and his activities will be confirmed to him. Napoléon tells Count Batte to make sure not to miss any occasion to increase the departure of sections of the flotilla taking into consideration that the season is still very favourable for this movement and that any delay could cause an infinite retardation of success. 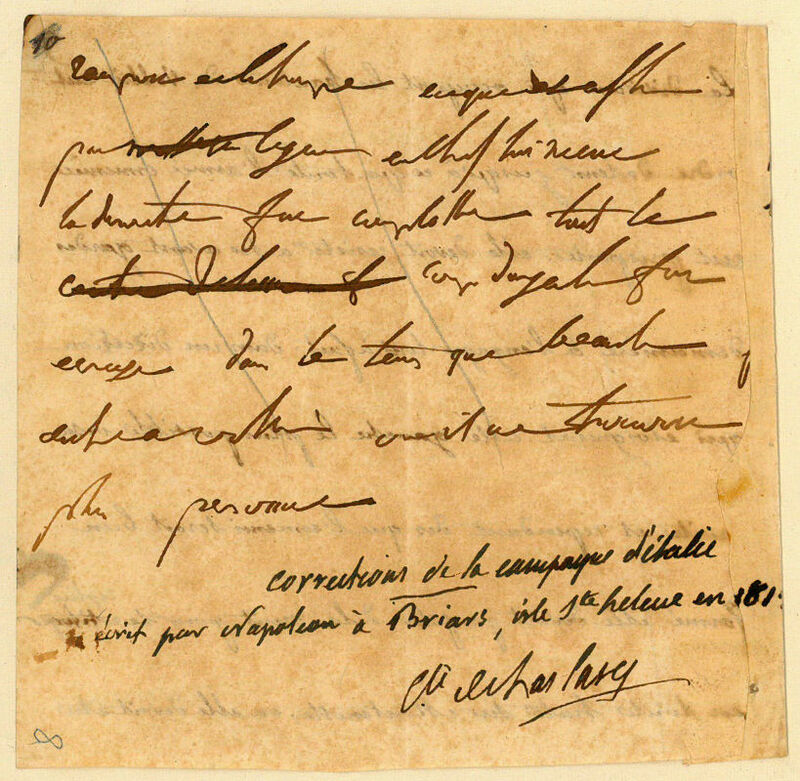 Napoléon informs Count Batte that upon his arrival at Cherbourg the Ministry of the Navy will address him with instructions concerning the task that he has to fulfill and concerning the ultimate destination of this important part of the flotilla. 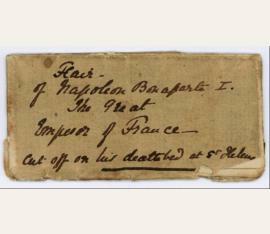 Napoléon ends his letter by pleading to god to keep Rear Admiral Count Batte in good health. 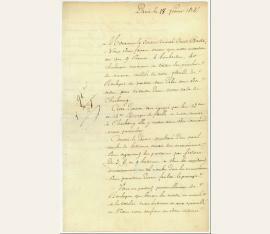 - Some tiny holes (not touching the signature)..
Emperor of the French (1769-1821). 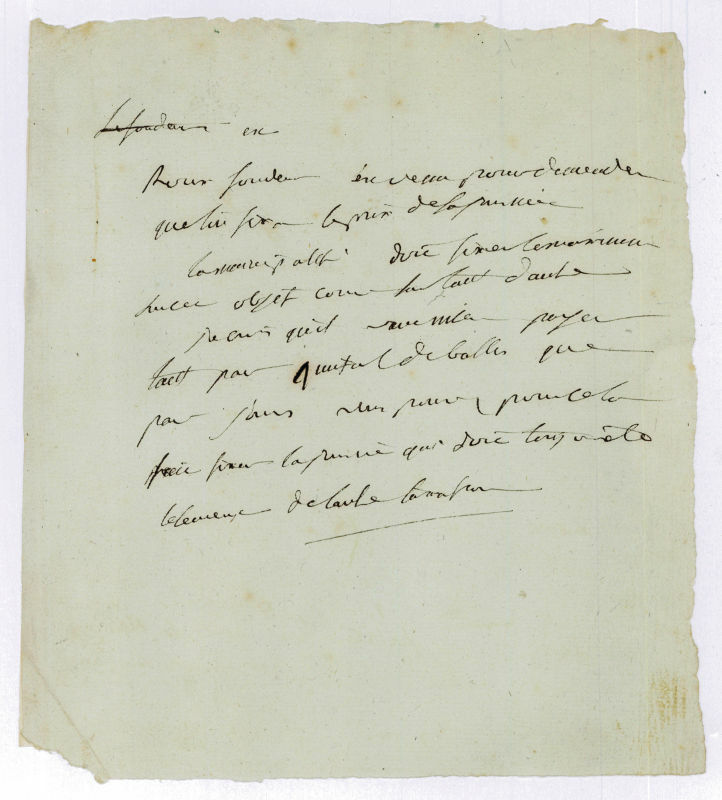 Autograph manuscript (6½ lines). Saint Helena. 102 x 103 mm. Mounted on a single page (8vo) together with a contemporary handwritten transcription. Notes on the Battle of Voltri (1796): "Rampon et la Harpe [-] par le Gal en chef lui meme la deroute fut complette tout le corps d'Argenteau fut ecrase dans le tem[p]s queu Beaulieu descendait a Voltri ou il ne trouvait plus personne" (transl. : "Rampon and la Harpe - by the commanding General himself - defeat was complete - all of d'Argenteau's corps was erased while Beaulieu descended to Voltri, where he found nobody left"). - With a certification of authenticity at the bottom: "corrections de la campagne d'Italie écrit par Napoleon à Briars, isle Ste helene en 1815 / Cte. de Las Cases". Emmanuel, comte de Las Cases and his son accompanied the former emperor to Saint Helena. There, he acted informally but very assiduously as his secretary, taking down numerous notes of his conversations which thereafter took form in the famous "Mémorial de Sainte-Hélène"..
Napoleon (1769-1821), französischer Kaiser. Brief mit e. U., Dresden, 9. Oktober 1813, ½ Seite 4°. Leicht knittrig, angestaubt und minimal fleckig. Personalentscheidung des Feldherrn Napoleon Bonaparte, wenige Tage vor der Völkerschlacht von Leipzig: „Monsieur le Comt[e] Nansouty en considération du G[énér]al Leture, mon intention est que vous le laissiez dans son commandement dans les Dragons de la Garde. Je prie dieu qu'il vous aie en Sa Sainte garde - Drèsde le 9 octobre 1813“. Beiliegt: 6 weitere, meist Napoleon betreffende Dokumente, u. a. ein von zahlreichen Personen unterzeichneter Entscheid zur Aufstellung eines Denkmals für den Kaiser.